Sometimes, you can’t make a lick of progress on a project until you decide not to do it. Sometimes, the fastest, most effective way to break through any kind of creative resistance is to say, “Screw this!” and walk away. Why It’s Good to Give Up. A few months ago, I was working with a client who needed to write a series of emails promoting his new program. He’d never written an email series before, so he hired me guide him through it. I gave him all my tips, techniques and templates for getting started, outlined a few ideas, and helped him hook into what his ideal clients need and want. 3 days later, he emailed me and said he couldn’t do it. He was so exhausted from trying to fight his resistance that he finally gave in and agreed to say No and let it go. Quite honestly, I thought I wouldn’t hear from him for weeks. But in just 6 days, he sent me rough copy for 3 emails… and that copy was beautiful. Honest and full of passion. Clear and creatively unique. We met soon after and worked together to turn his rough copy into final drafts, added 2 more emails, and his email series was done. And it was really, really good. I can’t explain the precise alchemy of this, but somehow, by fully allowing yourself your Inner No, you allow your Inner Yes to emerge. 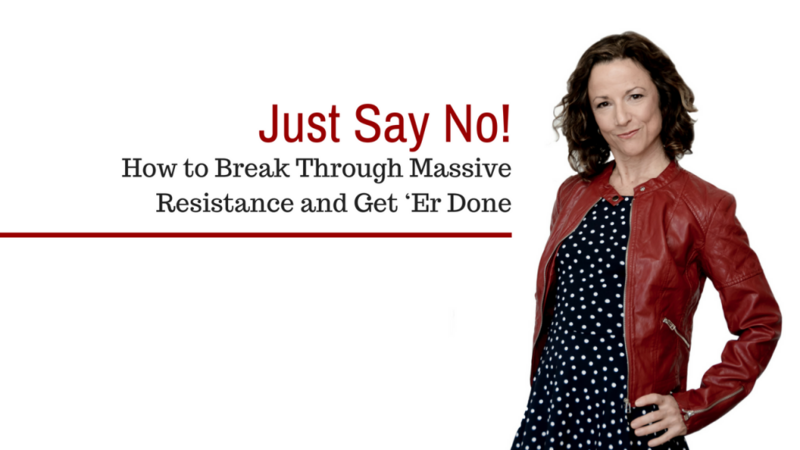 By saying No, and meaning it, you melt any resistance to the creative process because you’ve abdicated the fight. And the resistance has nothing to resist against. So, it dissolves. And so does the self-created paralysis that got you so rigidly bound up in the first place. When you give up instead of trying to push with do-or-die bravado, when you go with the resistance instead of fighting it, when you refuse to make yourself miserable and stressed out and choose instead to say, “Forget this!” you shake yourself loose of the energetic and mental restraints blocking the flow of your creativity and productivity. But when you bear down, grit your teeth, and hurl yourself forward, no matter how many times you’ve smashed your head against that invisible wall, you shut yourself off from your best ideas, waste huge amounts of time, raise your blood pressure, and ultimately… produce lousy work. There have been many times in my life when I was invested strongly in a creative project that (somewhere along the line) became a source of constant frustration, insomnia, and crippling fear of failure. Because the project was important to me, or because I’d made a commitment to myself or someone else, I would keep hammering away at it with all my might, determination, and focus. I didn’t want the resistance to win. I didn’t want to admit defeat. But the truth was, I was getting nowhere. And it was killing me. I was so tight, tense, and unable to function, much less create anything worthwhile, I finally had to throw up my hands, surrender, and say out loud, “No! No! No! I’m not doing this! I’m done! Forget it!” And the minute I did (and did so without guilt or regret), I felt immediate relief. I could relax, breathe, cry a little, and remember what it felt like to be me. By giving myself full permission to say No and mean it, I was able to get back in touch with my deeper, straight-from-the-heart “Yes!” By letting go of my “should” and “gotta,” I was able to remember why I wanted to do that project in the first place. I was able to reconnect to the project behind the project, which often was to be of service, to make a difference, or to simply express myself. All of my self-created obstacles — all the tension, efforting and need to be perfect or get it right — had stifled the purity and momentum of my original desire and suffocated any gasp of creative energy I might have had. But by saying “No!” to the struggle, by bowing out of the fight, those obstacles disappeared. Sure… there are times when you need to give yourself a little push. Just enough to break through that initial membrane of resistance, that inner “I don’t wanna!” that often shows up at the beginning of a creative project or when you’re not sure what to do next. There are times when you need to buck up and just keep going. But… if you find that your desire to create has been replaced by a nasty snarl of frustration, aggravation, and dread, and you’re hating the process, and everything you try only adds to your frustration… stand up, walk away, and say, “No. Sorry. Not doing this.” And mean it. If you’re bound to a deadline, see if you can change it. If you can’t, say “No!” and leave it alone for at least for a day. What you imagine you’re losing in time you’ll more than make up for, believe me. Because when you come back to the project, both your creativity and productivity will be freed up, and what was once hard an impossible will be so much easier and delightful. So, when the going gets tough, the tough may get going. 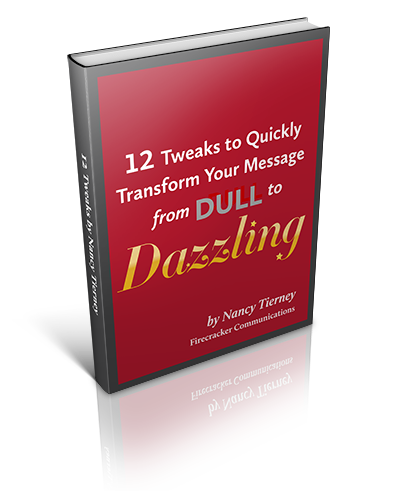 But you know… they’d be a lot better off – and a lot happier and more creatively inspired – if they just said, “No! Nope! No, thank you! I ain’t gonna do it!” and walked away.